6. Two farmers were cultivating wheat on their respective agricultural land in a village. Farmer A had an average production of 20 bushels from a hectare. Fanner B, who had 15 hectares of more land dedicated to wheat cultivation, had an output of 30 bushels of wheat from a hectare. If farmer B harvested 530 bushels of wheat more than farmer A, how many bushels of wheat did farmer A cultivate? 13. A reputed paint company plans to award prizes to its top three salespersons, with the highest prize going to the top salesperson, the next highest prize to the next salesperson and a smaller prize to the third-ranking salesperson. If the company has 15 salespersons, how many different arrangements of winners are possible (Assume there are no ties)? 14. What is the sum of the integers 54 through 196 inclusive? 18. In an MBA entrance examination, a minimum is to be secured in each of the 6 sections to qualify the cut-offs. In how many ways can a candidate fail to secure the cut-offs? 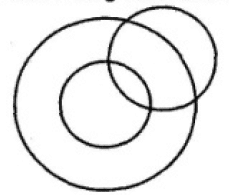 Directions for questions 21-24: Based on the figure given below, the relationship of the terms to the right of:: is same as that on the left. Find the missing terms. 21. GHF: CDB :: EFD : ? 22. HNP1: PDA :: DLP : ? Directions for questions 25-27: Read the information provided and answer the questions which follow. • The people of one tribe cannot many any other member of their own tribe though they can marry’ people from other tribe. • After being married, each male member ceases to be a member of that tribe in which he was born and becomes the member of the tribe to which his wife belongs. • The females continue to remain members of the tribe in which they were born even after marriage. • On birth, the child becomes the member of the mother’s tribe. • The males become members of the tribe in which they were born when they become divorcee or widower. • As per norms, nobody can have more than one spouse at a given point of time. Directions for questions 28-31: On the basis of the information provided, answer the questions below. Six friends Ana, Belle, Cinderella, Diana, Elsa and Ferida arc sitting on the ground in a hexagonal shape discussing their trades i.e. cook, hairdresser, washerwoman, tailor, carpenter and plumber. All the sides of the hexagon are of the same length. The seating arrangement is subject to following conditions. • Hairdresser and Cinderella are adjacent to each other. • Plumber is in the middle of tailor and Cinderella in a clockwise direction. • Cook is adjacent to the Carpenter who is adjacent to Belle in an anti-clockwise direction. • Ferida is a plumber and Elsa is adjacent the cook. 28. Who is at the same distance from Diana as carpenter is from Diana? 29. If one neighbour of cook is Elsa, who is the other? 30. What are the trades of Diana and Elsa? 31. Who is sitting opposite to the plumber? Directions for questions 32-34: On the basis of the information provided, answer the questions below. A,B, C, E, F, G and H are 7 employees in an organisation working in different departments of Administration, Finance and Logistics. There. are atleast two employees in each department. Out of these 7, 3 are females and one is in each department. Each employee gets a different salary. F works in Administration and his only other colleague G earns the maximum. C, the least earner works in Finance. B and E are brothers and are not in the same department. A, husband of H, works in Finance and earns more than F, B and E. The wife in the couple earns more than the husband. 32. In which of the departments, does a group of 3 work? 34. In descending order of income, H is at which position? 39. Choose the conclusion which logically follows from the given statement irrespective of commonly known facts. Directions for questions 40-42: On the basis of the information provided, answer the questions below. Eight doctors P, Q, R, S, T, U, V, and W of the same family i.e. father, mother, father’s sister, mother’s brother, 2 daughters and 2 sons visit a clinic every day for one hour each except on Monday which is a holiday. The timings are 9 am to 1 pm and 2 pm to 6 pm, with lunch time from 1 pm to 2 pm. Each has a different specialisation namely Cardiologist, Orthodontist, Neurologist, Paediatrician, Gynaecologist, Urologist, Radiologist and General Physician. • No doctor visits the clinic before doctor Q and after doctor U. • The Orthodontist visits right after lunch and is followed by R who is a female. • The mother comes in at the same place before lunch as the younger son P after lunch. • The General Physician is the sister of Urologist’s father and is last to visit before lunch. • The Cardiologist is the first while the elder daughter is the last to visit. • T is the mother’s brother of U and visits between the father and mother. • S, the mother comes at 11 am after the father. • The Neurologist is at the same place after lunch as the Gynaecologist before lunch and comes right after Urologist. Directions for questions 43-47: After receiving the disturbing news of falling standards the Supreme Council of Confederation of five kingdoms is considering to conduct joint entrance examination for all students in these kingdoms for Vaidya Ratna course. As a First step, it has been decided to review the past five year data about the individual entrance examination of the kingdoms so that an appropriate action can be taken. 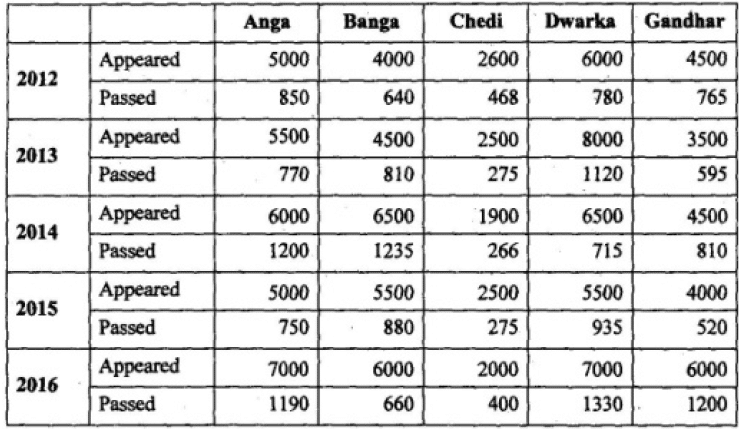 Study the table given below and answer the questions. 43. What is the overall pass percentage from Anga kingdom for all the years together? 44. In which of the following years, total number of candidates passed from all the kingdoms is lowest? 45. In which of the following years. Banga kingdom recorded highest pass percentage? 46. What is the overall pass percentage of all the kingdoms together in the year 2013? 47. Highest number of candidates passed are from which of the following kingdoms for all the years together? Directions for questions 48-52: T-Nation, a T Shirt manufacturing company has unleashed 5- 5-5 strategy, five brands (Ultimate, Supreme, Smash, Paramount, Astute), five sizes (S, M, L, XL, XXL), and five Stores (SI, S2, S3, S4, S5) to capture New Delhi market. 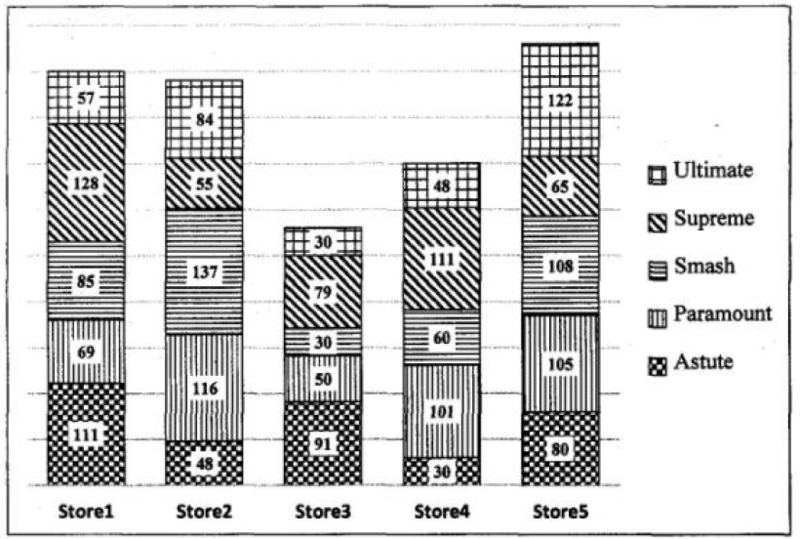 Number of T- Shirts in each of the store is given in the stacked bar chart below. Note: Visibility of a brand in a store is given by number of T-shirts of the brand in the store by total number of T-Shirts in the store. Visibility across the stores is measured by sum of the scores of visibility of a brand in a store. 48. Which brand of T-shirt has more visibility across the stores? 49. Which brand has lowest visibility score in any of the stores? 51. What is the approximate share of Supreme brand in all stores together? 52. Approximately, by what percentage are Smash T-shirts greater than Ultimate T-shirts in all the stores together? Directions for questions 53-57: Given below is the data about Domestic Investment (DI) and Foreign Investment (FI) in 9 different sectors over 5 year period. 53. What is the approximate ratio of the total investment in Energy sector to that of Financial services sector? 54. Absolute difference between the Total DI and Total FI is highest for which-sector? 55. In which year the average DI is the highest? 56. Which Sector has received the 2nd lowest investment from DI for the total period? 57. What is the approximate ratio of total DI to total FI? 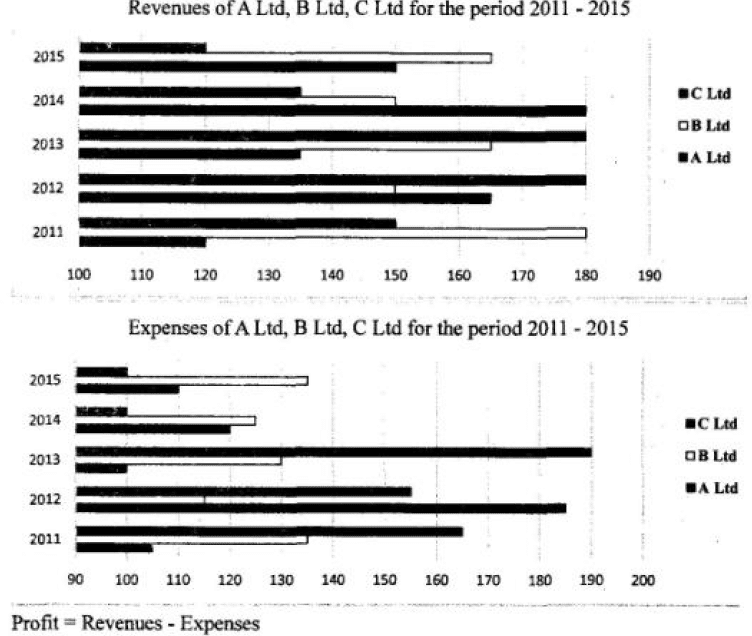 Directions for questions 58-62: The following 2 bar charts represent revenues and expenses (in thousands) of A Ltd, B Ltd, and C Ltd over a period of five years. 58. For which company, the average annual expenses were maximum in the given period? 59. For which year, the average annual revenue (considering all three companies) was the maximum? 60. What was the approximate percentage decline in the revenue of C Ltd in 2015 as compared to the revenue in 2012? 61. 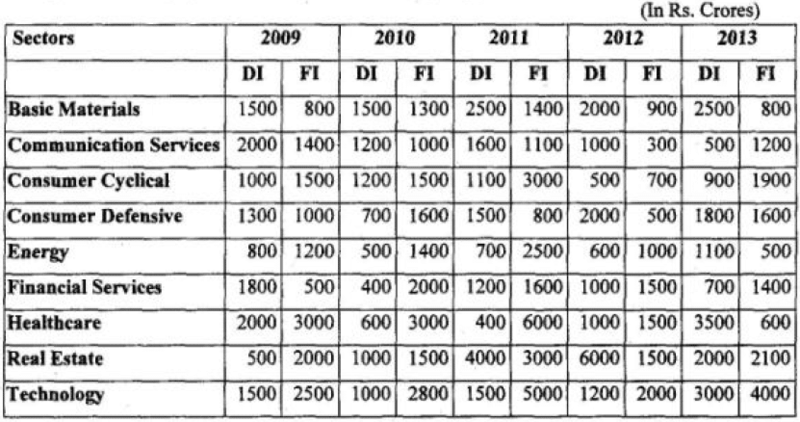 What was the approximate absolute difference between the average revenue of A Ltd in 2011,2012 and 2013 and the average revenue of B Ltd in 2013,2014 and 2015? 62. For which of the following years the percentage of rise/fall in profit from the previous year was the maximum for A Ltd? Directions for questions 63-78: Read the following passages carefully and answer the questions given at the end of each passage. In a study of 150 emerging nations looking back fifty years, it was found that the single most powerful driver of economic booms was sustained growth in exports especially of manufactured products. Exporting simple manufactured goods not only increases income and consumption at home, it generates foreign revenues that allow the country to import the machinery and materials needed to improve its factories without running up huge foreign bills and debts. In short, in the case of manufacturing, one good investment leads to another. Once an economy starts down the manufacturing path, its momentum can carry it in the right direction for some time. When the ratio of investment to GDP surpasses 30 percent, it tends to stick at the level for almost nine years (on an average). The reason being that many of these nations seemed to show a strong leadership commitment to investment, particularly to investment in manufacturing. Today various international authorities have estimated that the emerging world need many trillions of dollars in investment on these kinds of transport and communication networks. The modem outlier is India where investment as a share of the economy exceeded 30 percent of GDP over the course of the 2000s. but little of that money went into factories. Indian manufacturing had been stagnant for decades at around 15 percent of GDP. The stagnation stems from the failures of the state to build functioning ports and power plants and to create an environment in which the rules governing labour, land and capital are designed and enforced in a way that encourages entrepreneurs to invest, particularly in factories. India has disappointed on both counts creating labour friendly rules and workable land acquisition norms. Between 1989 and 2010 India generated about ten million new jobs in manufacturing, but nearly all those jobs were created in enterprises that are small and informal and thus better suited to dodge India’s bureaucracy and its extremely restrictive rules regarding firing workers. It is commonly said in India that the labour laws are so onerous that it is practically impossible to comply with even half of them without violating the other half. Informal shops, many of them one man operations, now account for 39 percent of India’s manufacturing workforce, up from 19 percent in 1989 and they are simply too small to compete in global markets. Harvard economist Dam Rodrik calls manufacturing the “automatic escalator” of development, because once a country finds a niche in global manufacturing, productivity often seems to start rising automatically. During its boom years India was growing in large part on the strength of investment in technology service industries, not manufacturing. This was put forward as a development strategy. Instead of growing richer by exporting even more advanced manufactured products, India could grow rich by exporting the services demanded in this new information age. These arguments began to gain traction early in the 2010s. In new research on the “service escalator*’, a 2014 working paper from the World Bank made the case that the old growth escalator in manufacturing was already giving way to a new one in service industries. The report argued that while manufacturing is in retreat as a share of 24 the global economy and is producing fewer jobs, services are still growing, contributing more to growth in output and jobs for nations rich and poor. However, one basic problem with the idea of the service escalator is that in the emerging world most of the new service jobs are still in very traditional ventures. A decade on, India’s tech sector is still providing relatively simple IT services mainly in the same back office operations it started with and the number of new jobs it is creating is relatively small. In India only about two million people work in IT services, or less than 1 percent of the workforce. So far the rise of these service industries has not been big enough to drive the mass modernisation of rural farm economies. People can move quickly from working in the fields to working on an assembly line, because both rely for the most part on manual labour. The leap from the farm to the modem service sector is much tougher since those jobs often require advanced skills. Workers who have moved into IT service jobs have generally come from a pool of relatively better educated members of the urban middle class, who speak English and have at least some facility with computers. Finding jobs for the underemployed middle class is important but there are limits to how deeply it can transform the economy, because it is a relatively small part of the population. For now, the rule is still factories first, not services first. The company will tackle this problem much more readily if reverse innovation is part of its repertoire. And yet until recently PepsiCo took a glocalisation approach. The company developed products for the US and then sold and distributed substantially similar products throughout the world. As a result PepsiCo’s growth particularly in emerging markets hit a wall. The company’s brands bumped up against local needs, tastes and habits that could not be satisfied by lowest-common-denominator global products. Under the glocalisation scenario, what first appears to be promising momentum hits a wall – often sooner than later. The renown of even the most potent global brands wear thin when the offered product is neither designed expressly for local markets nor priced for local means. These days PepsiCo is finding ways to address sharp differences across borders by designing products with local tastes and consumer needs in mind and is capturing a greater share of the opportunity in emerging economies. But that’s not all. PepsiCo is finding that its innovations in emerging markets have the potential to have impact and deliver performance with purpose all over the world. For example, PepsiCo is finding that some long popular ingredients in emerging economies such as lentils in India have healthy profiles that suggest new dimensions for snacking across geographies. The company’s approach to reverse innovation combines local product development efforts, strong support from global resources, plus efforts to ensure that the raw material of PepsiCo’s innovations – ideas, flavours, ingredients, marketing expertise, packaging materials, manufacturing methods and so on can flow in any direction within the organisation. Concerns about childhood and adult obesity are on the rise. It’s not news that snack foods are not commonly associated with health and wellness. Nonetheless, PepsiCo saw that there was enormous opportunity for impact in creating options for healthier snacking. “Consumers interact with our products on three levels; the neurological level, the gut level and the metabolic level.” Traditionally food and beverage companies have focussed only on the first. The neurological level is where brands, marketing and sensory payloads operate. Looking at the problems of emerging markets it is important to also understand what PepsiCo’s products do to the person’s gut? What do they do to their body chemistry? If those effects arc ignored then it is indulgence without any balance. As PepsiCo geared up for its efforts to develop Aiiva. it wondered whether there were any examples in which PepsiCo had already practised successful reverse innovation. There was one such example in India. It was a lentil and rice based snack called Kurkure. Introduced more than a decade ago, it had grown to be Frito Lay India’s top selling product. PepsiCo had learnt a lot from the Kurkure experience. Once emerging nations aspired to have access to rich world products. But these days they want rich world quality baked into products with local origins. It exemplified the idea that innovations shouldn’t simply be handed down from on high. Typically women participate in the labour force at a very high rate in poor rural countries. The participation rate then falls as countries industrialise and move into the middle income class. Finally, if the country grows richer still, more families have the resources for higher education for women and from there they often enter the labour force in large numbers. Usually, economic growth goes hand in hand with emancipation of women. Among rich countries according to a 2015 study, female labour force participation ranges from nearly 80 percent in Switzerland to 70 percent in Germany and less than 60 percent in the United States and Japan. Only 68 percent of Canadian women participated in the workforce in 1990; two decades later that increased to 74 percent largely due to reforms including tax cuts for second earners and new childcare services. In Netherlands the female labour participation rate doubled since 1980 to 74 percent as a result of expanded parental leave policies and the spread of flexible, part time working arrangements. In a 2014 survey of 143 emerging countries, the World Bank found that 90 percent have at least one law that limits the economic opportunities available to women. These laws include bans or limitations on women owning property, opening a bank account, signing a contract, entering a courtroom, travelling alone, driving or controlling family finances. Such restrictions are particularly prevalent in the Middle East and South Asia with the world’s lowest female labour force participation, 26 and 35 percent respectively. According to data available with the International Labour Organization (ILO), between 2004 and 2011, when the Indian economy grew at a healthy average of about 7 percent, there was a decline in female participation in the country’s labour force from over 35 percent to 25 percent India also posted the lowest rate of female participation in the workforce among BRIC countries. India’s performance in female workforce participation stood at 27 percent, significantly behind China (64 percent), Brazil (59 percent), Russian Federation (57 percent), and South Africa (45 percent).The number of working women in India had climbed between 2000 and 2005, increasing from 34 percent to 37 percent, but since then the rate of women in the workforce has fallen to 27 percent as of 2014, said the report citing data from the World Bank. The gap between male and female workforce participation in urban areas in 2011 stood at 40 percent, compared to rural areas where the gap was about 30 percent. However, in certain sectors like financial services, Indian women lead the charge. While only one in 10 Indian companies are led by women, more than half of them are in the financial sector. Today, women head both the top public and private banks in India. Another example is India’s aviation sector, 11.7 percent of India’s 5,100 pilots are women, versus 3 percent worldwide. But these successes only represent a small section of women in the country. India does poorly in comparison to its neighbours despite a more robust economic growth. In comparison to India, women in Bangladesh have increased their participation in the labour market, which is due to the growth of the ready-made garment sector and a push to rural female employment. In 2015, women comprised of 43 percent of the labour force in Bangladesh. The rate has also increased in Pakistan, albeit from a very low starting point, while participation has remained relatively stable in Sri Lanka. Myanmar with 79 percent and Malaysia with 49 percent are also way ahead of India. Lack of access to higher education, fewer job opportunities, the lack of flexibility in working conditions, as well as domestic duties are cited as factors behind the low rates. Marriage significantly reduced the probability of women working by about 8 percent in rural areas and more than twice as much in urban areas, said an Assoc ham report. ILO attributes this to three factors: increasing educational enrolment, improvement in earnings of male workers that discourages women’s economic participation, and the lack of employment opportunities at certain levels of skills and qualifications discouraging women to seek work. The hurdles to working women often involve a combination of written laws and cultural norms. Cultures don’t change overnight but laws can. The IMF says that even a small step such as countries granting women the right to open a bank account can lead to substantial increase in female labour force participation over the next seven years. According to the United Nations Economic and Social Commission for Asia and the Pacific (ESCAP), even a 10 percent increase in women participating in the workforce can boost gross domestic product (GDP) by 0.3 percent The OECD recently estimated that eliminating the gender gap would lead to an overall increase in GDP of 12 percent in its member nations between 2015 and 2030. The GDP gains would peak close to 20 percent in both Japan and South Korea and more than 20 percent in Italy. A similar analysis by Booz and Company showed that closing the gender gap in emerging countries could yield even larger gains in GDP by 2020, ranging from a 34 percent gain in Egypt to 27 percent in India and 9 percent in Brazil. The Cyclopses according to mythology were a race of bad tempered and rather stupid one eyed giants. Not perhaps a great portend for a new generation of robots. But Andrew Davison a computer scientist at Imperial College, London, thinks one eye is enough for a robot, provided its brain can think fast enough. For a robot to work autonomously it has to understand its environment. Stereoscopic vision, integrating the images from two eyes looking at the same thing from different angles is one approach to achieve this, but it involves a lot of complicated computer processing. The preferred method these days therefore is Simultaneous Localisation and Mapping (SLAM) which uses sensors such as laser based range finders that see by bouncing beams of light off their surroundings and timing the return. Dr. Davison however wants to replace the range finders which are expensive and fiddly with a digital camera, which is small, cheap and well understood. With this in mind he is developing ways to use a single moving video camera to create continually updated 3D maps that can guide even the most hyperactive robots on its explorations. His technique involves collecting and integrating images taken from different angles as the camera goes on its travels. The trick is to manage to do this in real time, at frame rates of 100-1,000 per second. The shape of the world pops out easily from laser data because it represents a direct contour map of the surrounding area. A camera captures this geometry indirectly and so needs more (and smarter) computation if it is to generate something good enough for a self-directing robot. 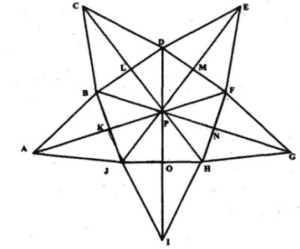 The answer is a form of triangulation, tracking features such as points and edges from one frame to the next. With enough measurements of the same set of features from different viewpoints, it is possible if you have a fast enough computer program to estimate their positions and thus by inference the location of the moving camera. However, developing such a program is no mean feat. In the milliseconds between successive frames, relevant information from each fresh image must be extracted and fused with the current map to produce an updated version. The higher the frame rate, the less time there is to do this work. 75. What is the main message of the above passage? 76. What message is the author conveying by drawing attention to a mythical figure and a one eyed robot? 77. Laser based range finders are more effective than digital cameras because (select the right option)? 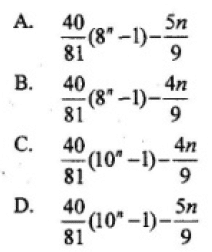 Directions for questions 79-82: Use the words in the table below to solve the questions. 79. Complete the crossword using the words from the above table. There are more words than required. 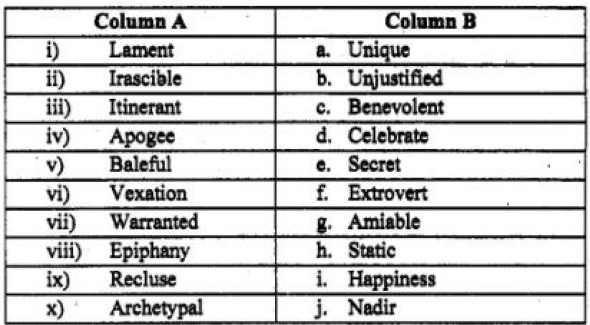 Directions for questions 80-82: Each question has explained the meaning of two words from the above table. Identify the correct matching words from the table. describe a female stage actor making her first public performance. It means “frequently met with”. The origin of the word comes from obvius “that is in the way, presenting itself readily, open, exposed, commonplace,” also from obviam (adv.) “in the way”, from qk “against” + viam. accusative of via “way”, meaning “plain to see, evident” is first recorded in 1630. The origin of the word dates back to 1889 (socca), later 1891 (socker). 1895 (soccer); originally university slang from a shortened form of Assoc., abbreviation of Association in Football Association. Directions for questions 88-89: Four words are given in each question, out of which one word is correctly spelt. Find the correctly spelt word. Directions for questions 90-93: In the following passage, fill in the blank spaces with the most appropriate word from the options provided. Come October and you arc burnt by the mid-day Sun. The storm and the sizzle is particularly __ 90___ as it comes after the relatively cool monsoon months. Though it is hot and muggy, that docs not prevent people from coming out on the streets to__ 91___ the traditional festivals. And it must be shopping time also, colourfully decorated showrooms are __92___ the passerby to let his hair down, splurge and take a___93___ of gifts home for family. After all, the New Year is just around. Directions for questions 94-95: In the following questions some parts of the sentence have been jumbled up. Re -arrange these parts which are labelled as (a), (b), (c) and (d) to produce the correct sequence in completing the sentence. Directions for questions 96-98: Fill up the blanks with appropriate word (idiom/colloquial) given in the options. 96. Mark is always eager to argue about how this business should be run. He seems to have a real ____ on his shoulder about it. 97. Vishnu thought the last problem on the test was a real_____ . It was much harder and more complex than any of the previous problems. 98. I used to be kind of a____ when I was little, but 1 lost most of the weight in my teenage years. 99. The Trans Pacific Partnership (TPP) or Trans Pacific Partnership Agreement (TPPA) is a trade agreement among twelve Pacific Rim countries, signed on 4 February 2016 in Auckland, New Zealand. Which of the following countries is not a member of TPP? 101. Which of the following best represents baking soda? 102. Which of the following country was not there in the UEFA Euro 2016 (Soccer Tournament) quarter-final? 104. Which of the following Indian states share border with multiple countries? 105. General elections were held in Myanmar on 8th November 2015. This has been the first openly-contested election held in the country since 1990. Which political party received the highest number of seats? 108. What was the theme of the 2016 National Youth Festival of India? 109. Which Indian player has created junior world record in “Javelin throw” in July 2016? 110. Which global credit information company is associated with Credit Information Bureau (India) Limited (CIBIL)? 111. 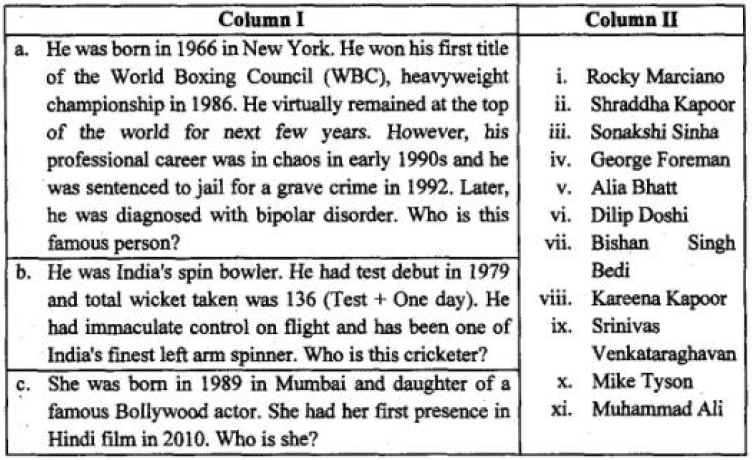 Match the famous personality in Column II from the information given in Column I. 112. What is the Currency of Bulgaria? 113. Bharat Heavy Electricals Ltd. (BHEL) commissioned 2 units each of 14 Megawatts at the Salma Hydro Electric Project in 2016. Identify the country where this project is located. 114. “Satyameva Jay ate*’ inscribed on one side of all Indian currency, has been derived from which of the following ancient Indian scripture? 115. Which country inaugurated the first electric road in the world for hybrid heavy transports? 117. Which of the following Company has acquired Jabong in July 2016? 119. The 2016 Joint Military Exercise “Maitree” has been conducted between India and which of the following countries? 120. What is Director Identification Number (DIN)? 121. Which of the following is not an elected post in India?